The University of British Columbia is home to one of the most successful college teams in the world but most people at the school don’t even know about it. The team doesn’t play basketball or football. Its five players are champions at a video game called League of Legends. Last year, the team, which was formed in 2011, won the North American Collegiate Championship, a tournament hosted by League of Legends developer Riot Games in Los Angeles, earning $180,000 in scholarships and the status of number one team in North America. On March 19, UBC beat its rivals, Simon Fraser University, advancing the team to the semi-finals of this year’s championship. After this win, manager Carman Lam predicts the team will win the title and $180,000 prize for a second year in a row. “I think it will be a déjà vu,” said Lam. That success is the result of a huge amount of time the team puts in. 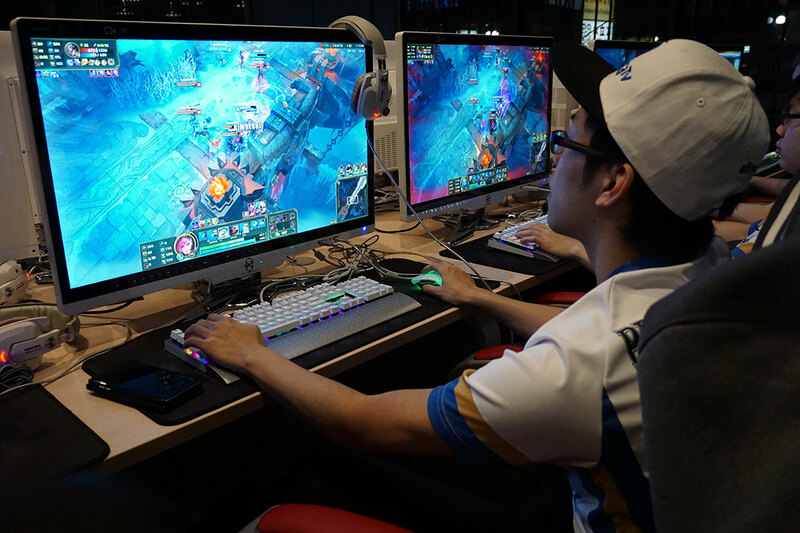 “For scrimmages against other competitive teams, it’ll be probably two to three times a week, maybe anywhere from six to eight to 10 hours, and then all the players play by themselves individually to climb up the competitive ranking, and that can take anywhere from 10 to maybe 60, 70 hours a week,” said Dong. Team member Jason Dong plays a League of Legends match. League of Legends is an online video game, released in 2009 by Riot Games. Two teams of five players battle across a playing field with the intent of destroying the enemy base. Riot launched the League of Legends Championship Series in 2013, with millions tuning in every weekend to watch professional teams battle for the title of best in the world. Riot expanded its competitive operation to universities in 2015, where the game is very popular. The regular season broadcasts had an average of 70,000 viewers. At its peak, the championship broadcast had 100,000 concurrent viewers. The series divides 32 top university teams into four conferences, North, South, East and West, and the best team in each conference goes on to compete in the championship tournament. According to Joe Dodson, data ambassador at the video-game-industry market research firm EEDAR, gamers are attracted to eSports because the online competitions make a spectacle of a game that many already like. The competitions provide expert commentators analyzing the action, including post-game interviews, and overlays on the screen with extra information that regular players don’t get. “It’s the difference between HBO Fight Night and backyard boxing,” said Dodson. 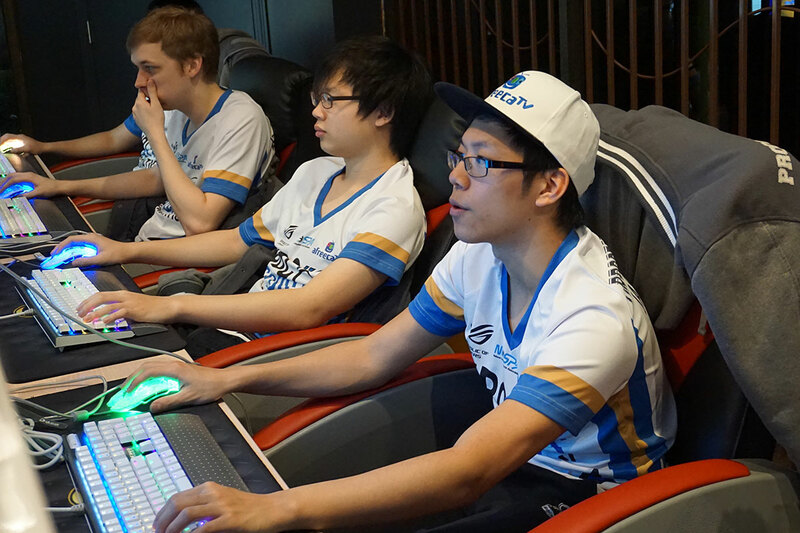 Some of the only times the players get to work together in person are at Internet cafes like this one. After beating SFU, the UBC team is one step closer to facing its biggest rival again, Robert Morris University in Illinois. Last year, the two teams met in the finals and UBC emerged victorious. In contrast to the UBC team, Robert Morris’s gets hefty support from the university. In 2014, the eSports program opened as part of the university’s athletic department. It was the first of more than five universities to do so. RMU’s head coach, Ferris Ganzman, said that varsity status has allowed the university to provide more resources for their players. “We were able to bring in staff. Our coaches are able to be salaried, so we were able to bring in a lot of really high quality people that otherwise might not be possible in just a traditional club,” said Ganzman. The RMU team has access to similar benefits that traditional varsity teams have, like training facilities, academic assistance, and sports psychologists. The UBC team’s staff — a coach, a manager, and an analyst — is unpaid. Most of the winnings the UBC team has earned come in the form of scholarships that go directly from Riot Games to UBC, with whatever is left over going to the students after graduation. The players said they would give a cut of their winnings this year to the staff if they are successful. From left to right: Manager Carman Lam, coach Simon Jeon and players Jason Dong, Bob Qin, Sean Wang and Jeremy Koberstein. The team is on top for now, but that could all change next year. Dong attributes much of the current team’s success to Lam’s management. “She helps us out a lot with our scheduling. She arranges all our sponsors and she really gets everything ready for us,” said Dong. However, Lam said that she won’t be able to continue as a volunteer for much longer. “If we don’t have support from UBC, in the future, it’s going to really depend on the people involved with the club and team and how passionate they are in keeping and maintaining the infrastructure we have now and improving that,” said Lam. Coach Simon Jeon may not be around next year either. “I think it will be really hard to find a coach who is willing to volunteer and work for free,” said Jeon. UBC has no plans to create a program like RMU’s. Lam believes it would be in UBC’s interest to give the team varsity status because of the recognition the team brings to the school. 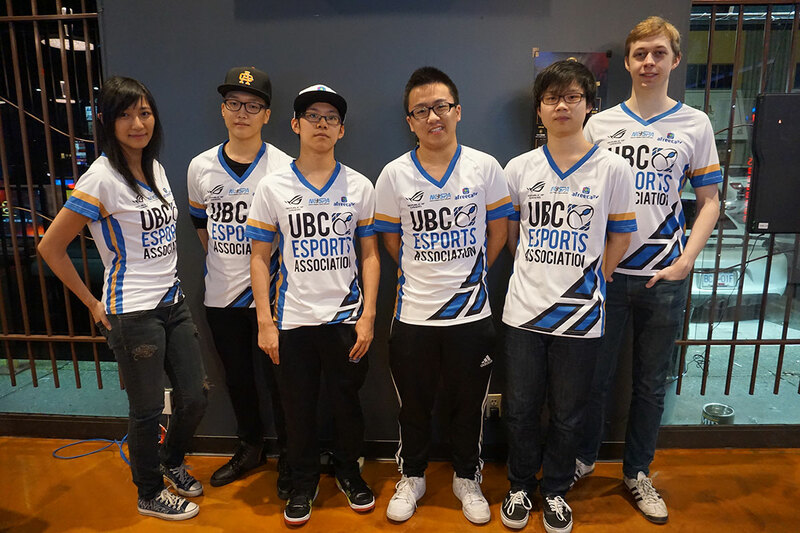 “There are so many students and schools who know about UBC because of our eSports team. I have a lot of high school students telling me that they want to come to UBC because of our eSports club and team,” said Lam. Riot Games play lead Michael Sherman also feels that UBC could benefit from school support. “Something that UBC lacks, that they could gain from a varsity program, is definitely sustainability,” said Sherman. Hopper said the League of Legends team can apply to become a sport club. UBC sport clubs are supported by UBC athletics. The money they get helps them to pay for administration and coaching as well as travel costs. Lam said they have not pursued gaining varsity or sport club status, but this is something they want to do in the future. It is too late for next year as they missed the deadline. For now though, the UBC players are focused on winning the championship title in May and they’ll worry about the rest later.